Cavities are one of the most common dental problems – in fact, the vast majority of Americans have at least one of these by the time they reach adulthood. 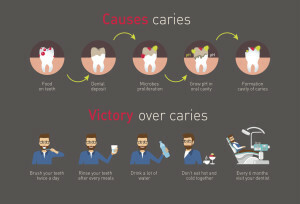 But even though dental caries are common, that doesn’t mean you should take them lightly. If left untreated, cavities can cause sensitivity, pain, and dangerous oral infections. In this post, the team at Nawrocki Dental, your preferred dentist in Cocoa Beach, FL, explains everything you need to know about cavities. As the most respected family dentist in Cocoa Beach, FL, Dr. Gary Nawrocki knows about cavities. He shares the technical name for a cavity is dental caries, which are permanently damaged areas in the teeth that develop into tiny holes. Generally, cavities are formed when the bacteria in your mouth turn sugar and carbs into acids. These acids compromise your enamel (the hard outer covering of the teeth), eventually wearing through them and eroding the tooth’s surface. Brush gently for two minutes twice a day, using fluoride toothpaste that remineralizes your enamel. Floss at least once a day to prevent cavities in between teeth and along the gum line. Avoid sweets, especially in beverages like sodas and juices that bathe your teeth in sugar with every sip. Limit snacking, since eating constantly prevents your saliva from naturally remineralizing teeth. Chew gum with xylitol, since this smile friendly sweetener helps reduce the risk of cavities – this is a great option when you’re away from your toothbrush. Eat cheese, since the pH balance in this dairy product neutralizes acids and helps keep teeth strong. See us at least twice a year for deep cleanings to remove tartar buildup and plaque that cause dental caries. How Can You Treat My Cavities? Tooth-Colored Fillings – Made of composite resin, these blend right in with your natural grin. Dental Crowns – To address larger, more complex carious teeth. Root Canal Therapy – Ending the dental pain and sensitivity caused by oral infections that stem from cavities. Regardless of what treatment method is right for you, we’ll always keep you relaxed and pain-free during your cavity restoration. And, if taking care of your cavities brings out your dental anxiety, you don’t have to worry – we offer the safest sedation dentistry options in the area to take care of your teeth before issues get out of hand. Now that you know everything you need to know about cavities, schedule your appointment with Nawrocki Dental to keep your pearly whites healthy and free of dental caries.